Halloween is coming! 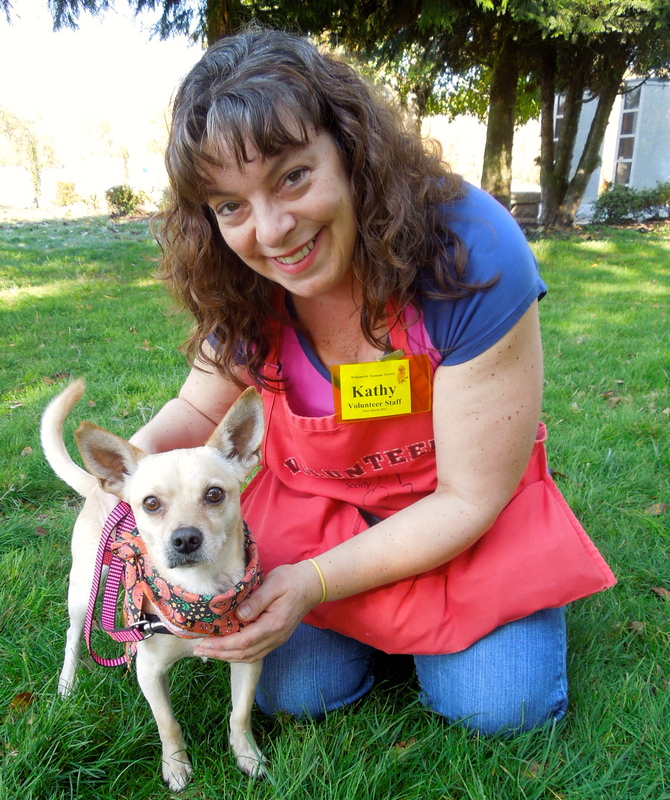 It was great to be back at Willamette Humane Society after being gone for more than two weeks! 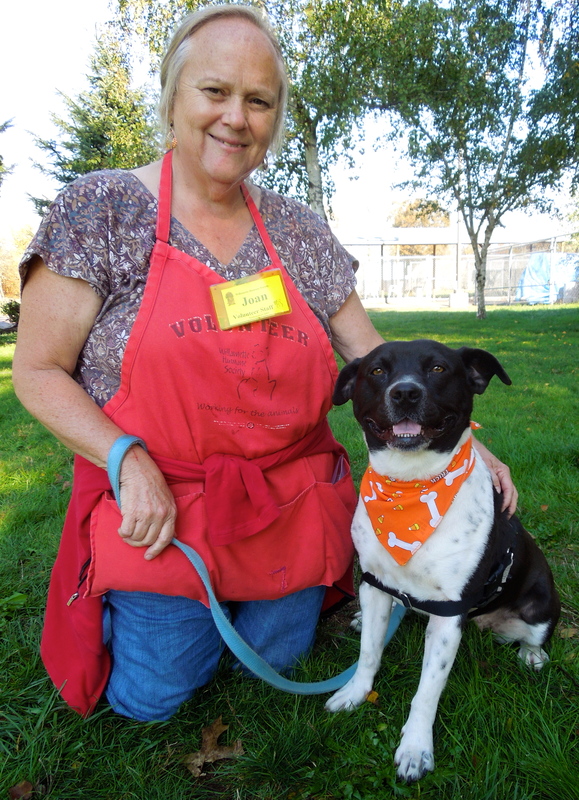 It was wonderful to see my fellow volunteer “peeps” and, of course, all of the new dogs as well some old friends who are still waiting for their forever homes. 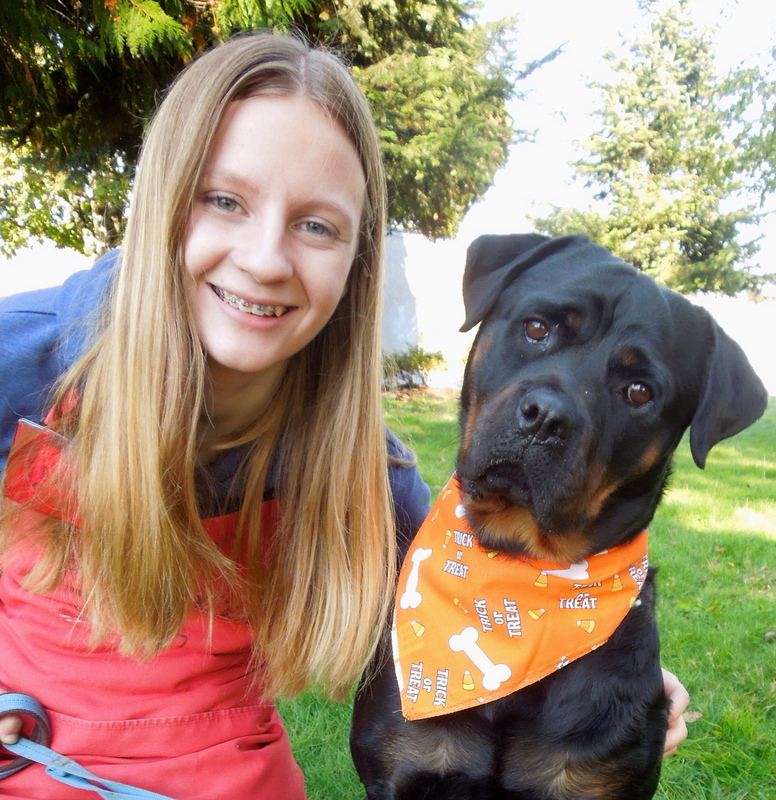 I brought along a couple of fun Halloween bandanas and the dogs were great sports and wore them without complaint. 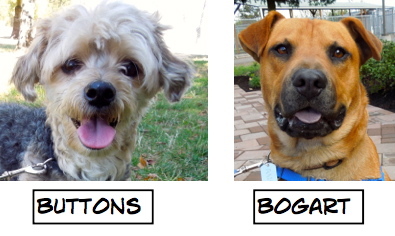 But before I talk about some of our terrific available dogs, here are the Blog dogs who were adopted while I was gone. Everyone here likes me! You will, too! 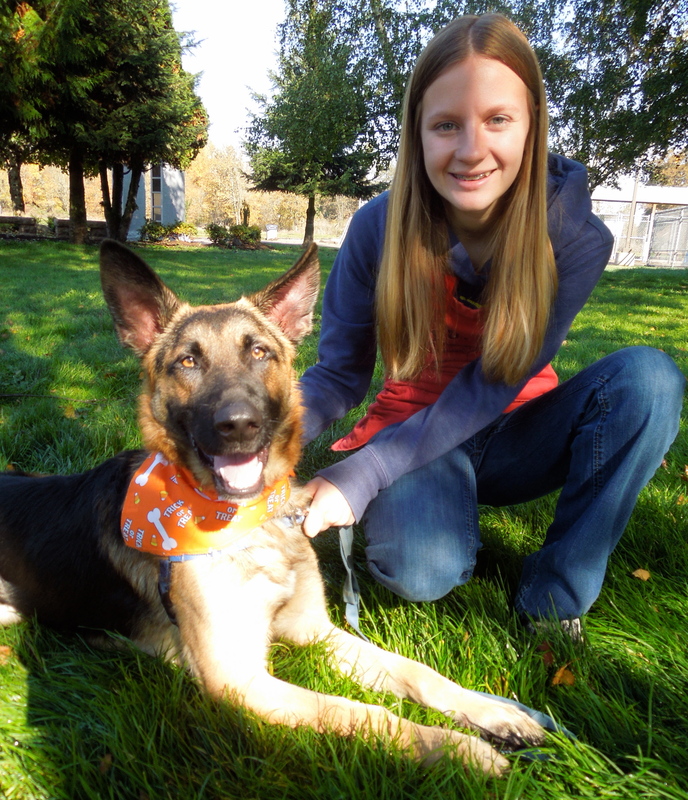 The first new dog I met today was Logan, a one-year-old German Shepherd mix who is such a delightful young dog! He’s a big boy, but walks well on leash and listens to directions. 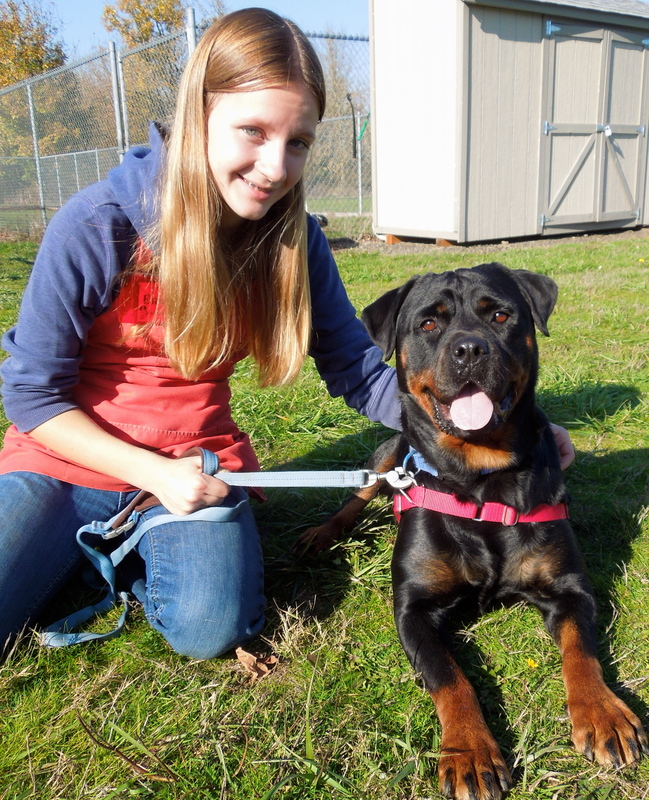 He already knows several commands, but would love to take some of the WHS training classes here at the shelter. He is treat-motivated and takes them politely, so will be easy to train. Here he is today with Emelynn, one of his many fans. Yes, I really am this cute in person! Can you look at this face and not smile? 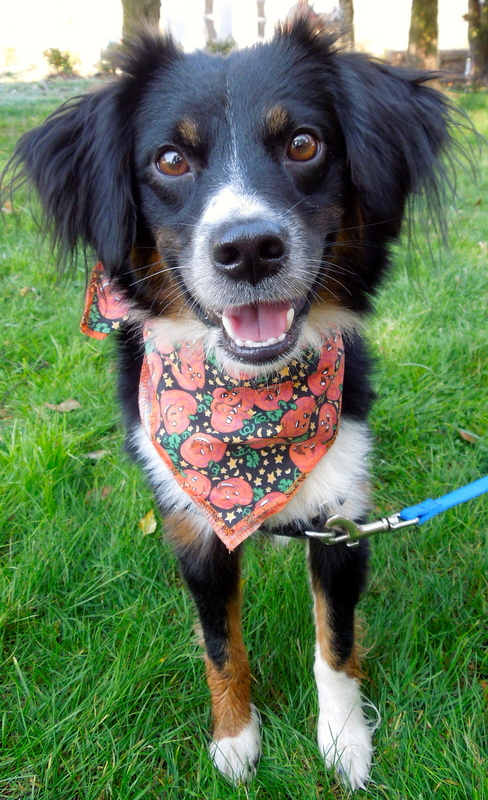 This is Batik, a two-year-old Australian Shepherd mix. She is such a sweetheart! She takes treats nicely and loves them, which will make her a good trainee. She’d make a good dog for a first-time owner. Here she is today showing her personality with Angie. She already has three holds on her, so will probably be going home very soon! Need a partner for jogging? Running? Playing fetch? How about for sitting at your feet (or on the couch)? 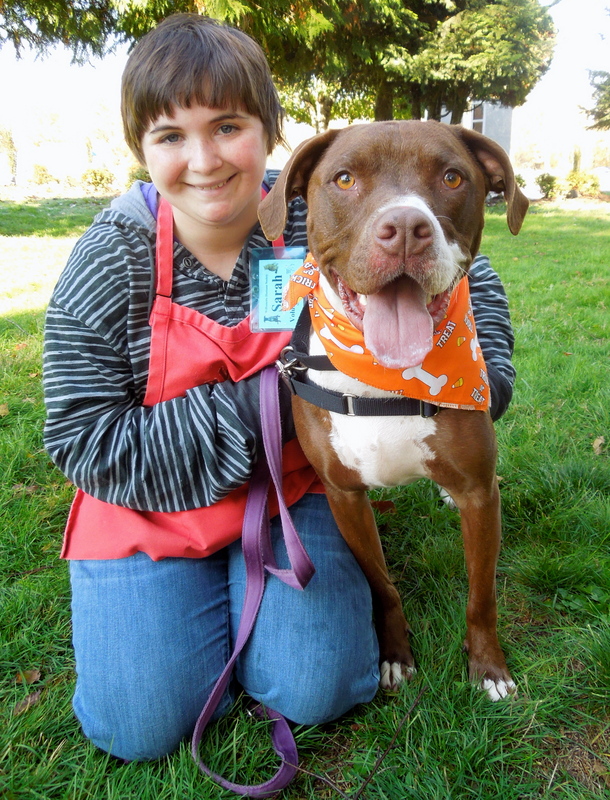 This young, energetic boy is Endo, a three-year-old Pit Bull Terrier mix and a new favorite of Sarah’s. Looking for a dog with a sense of humor? Endo is your man! He is such a happy dog who will need exercise and a yard to romp in. He is good-natured and would be an ideal candidate for our WHS training classes. There is no doubt that this boy believes that life is FUN! Do you need a small dog AND a big one? Meet Minor, a two-year-old Terrier mix. 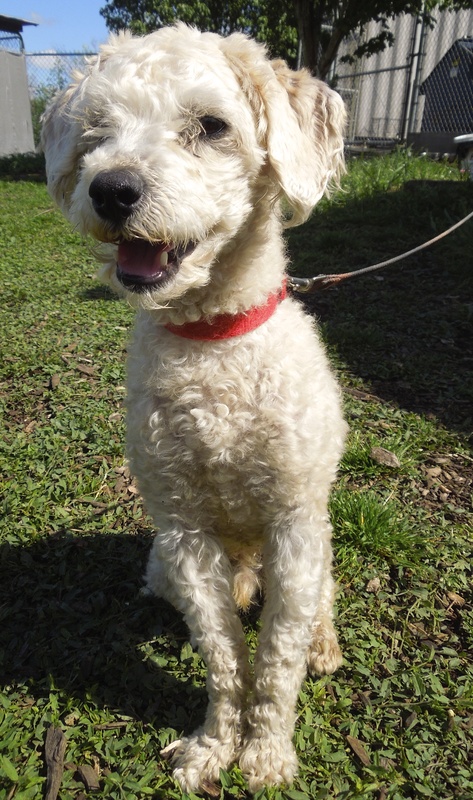 He is a bit timid on his own, but he has a best friend named Major and they are hoping to go to a home together. Here is Minor today with Kathy. And this is Major. 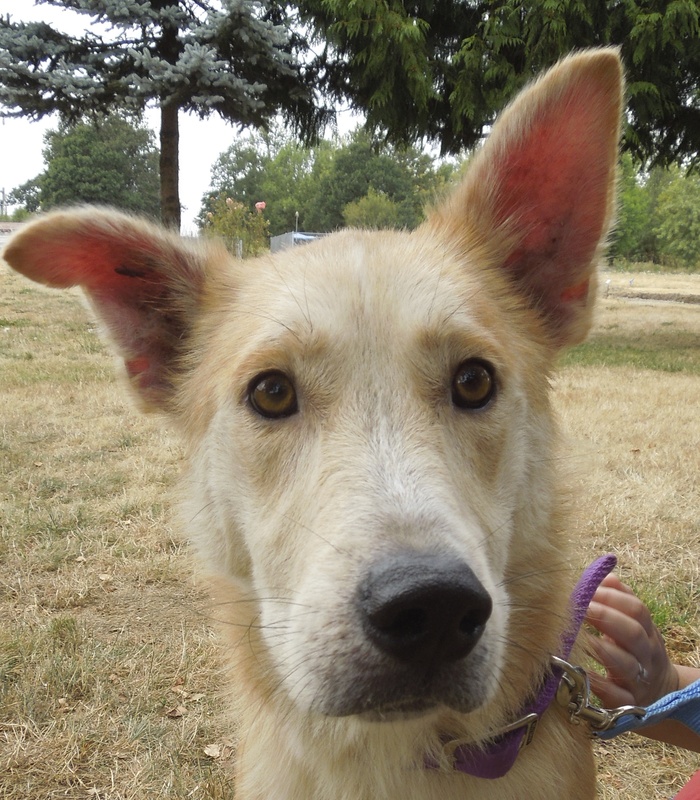 He is a two-year-old Shepherd mix. Major has a ton of energy and loves his best friend, Minor. 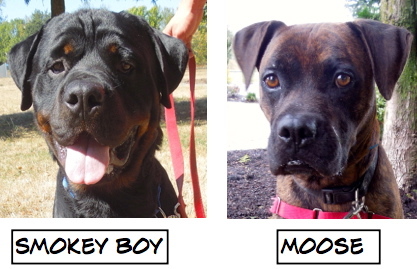 We’re hoping these BFFs can find just the right home for them both! My name is Jane and I’m new here. I’m waiting for my new family! 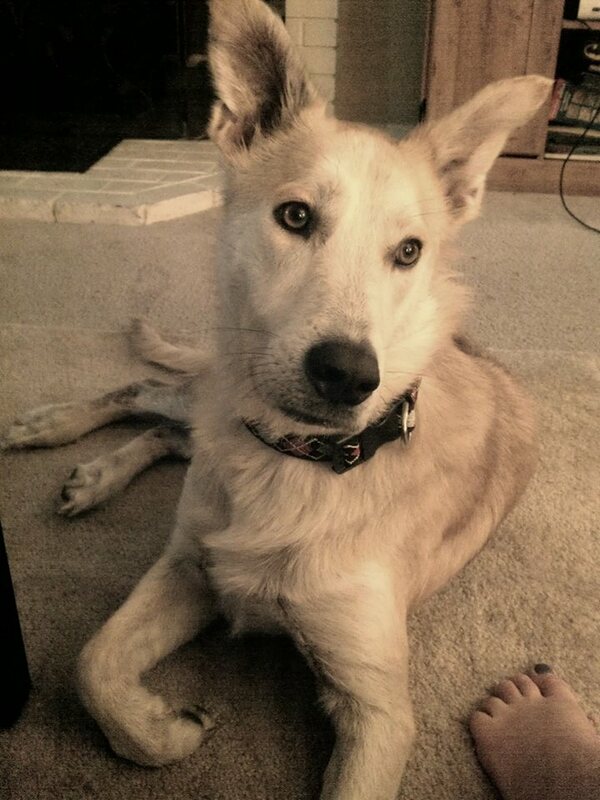 Another new dog to me was Jane, a one-year-old Shepherd mix. She was spending time with new volunteer walker Carol this afternoon. Jane is a gentle soul. She took my treats gently, and was happy to pose for her pictures. She knows several commands. Although I just met her, she won my heart! Yep, I’ve got it all…looks, personality, and smarts! He’s right! 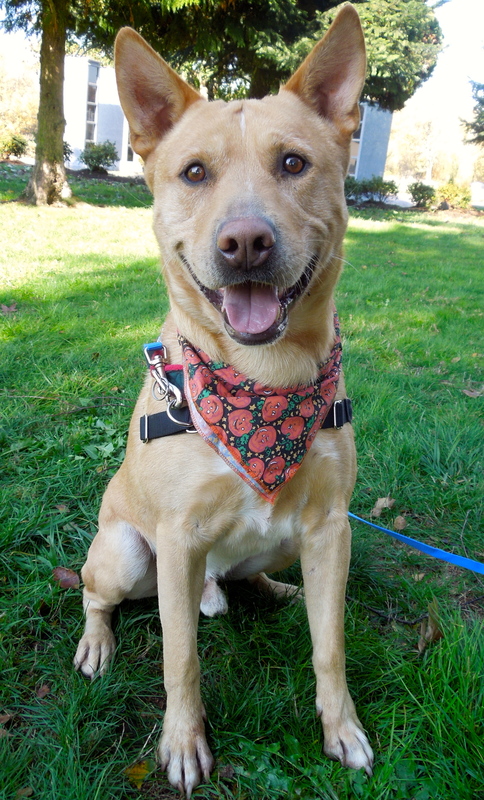 Reno is a four-year-old Lab mix who is pretty much the whole package. He walks beautifully on leash, takes treats gently, already knows several commands, and is food-motivated. He’d love to attend some training classes to learn more stuff. He won Angie’s affection very quickly. What a great dog! 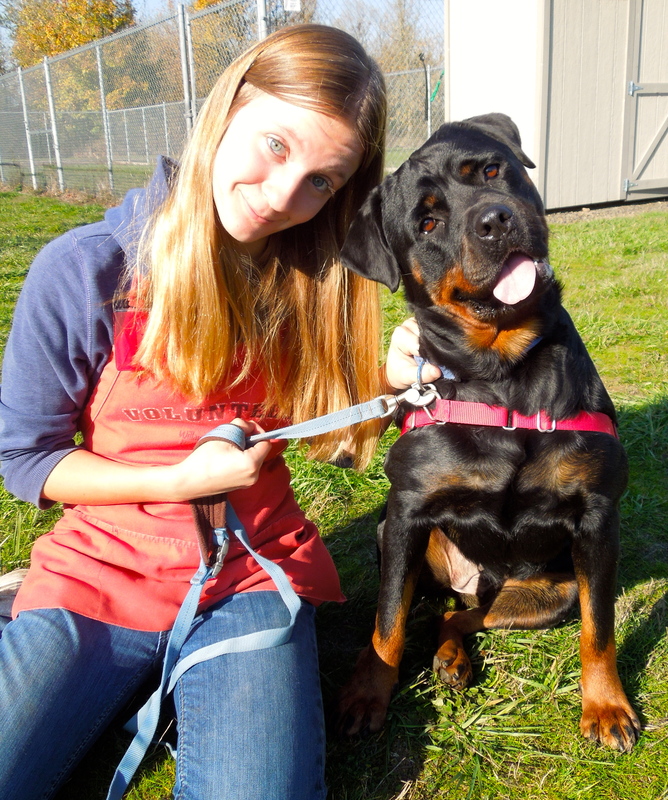 Emelynn’s pick of the week was Prieta, a one-year-old Rottweiler who was adopted and returned because she needs a secure fence. Prieta has an extremely sweet and gentle personality. She has been an outdoor dog, but would like to be an indoor/outdoor dog. She will need some additional house-training, however. Emelynn is one of Prieta’s biggest fans, as is easy to tell from these pictures! 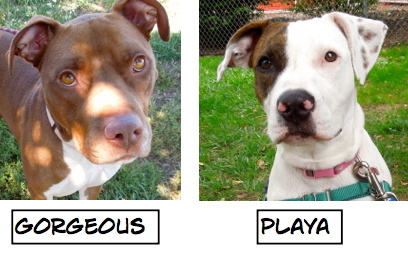 We’re still here…waiting for our forever homes. I had hoped that my favorite long-termers would all have found new homes by the time I returned from my trip, but while I was happy to see them, I was disappointed they are still waiting. 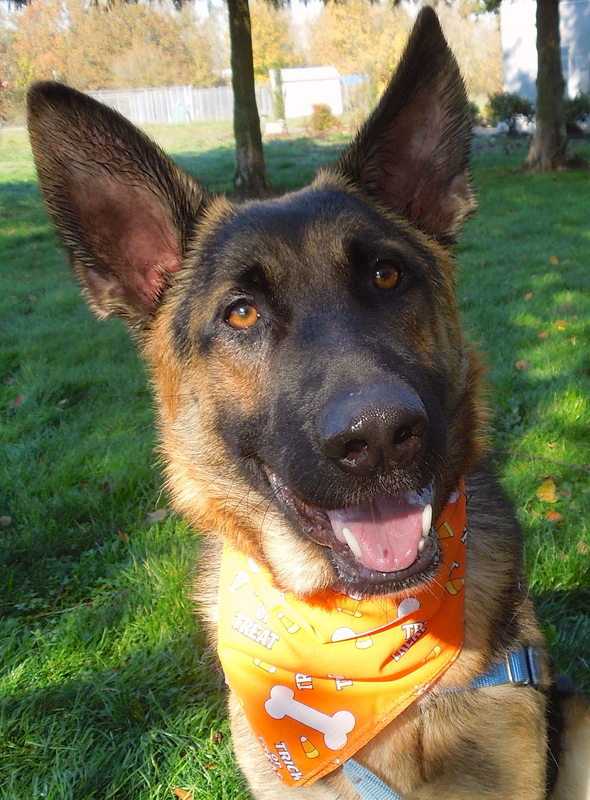 They are not discouraged, however, and all happily let me put Halloween bandanas on them. 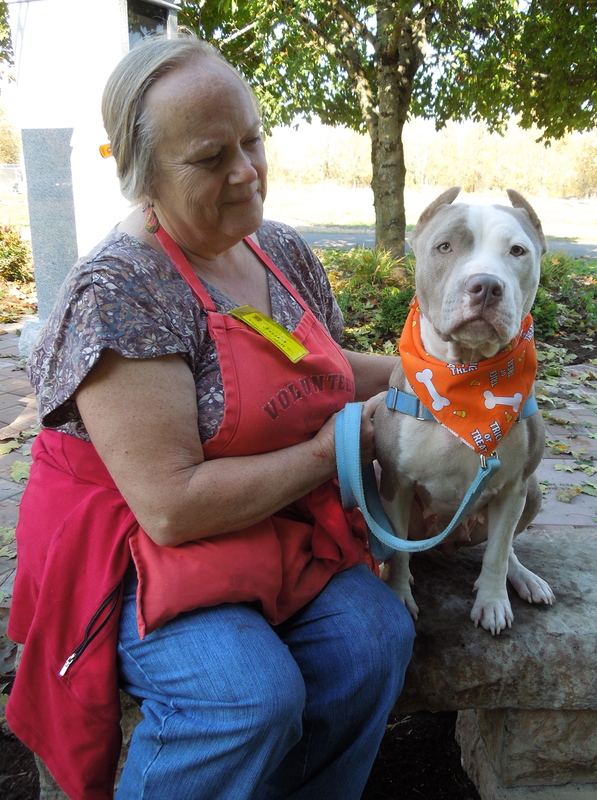 Emma is a three-year-old American Staffordshire mix. She was found in a San Fernando Valley neighborhood one morning, running up to anyone she saw, desperately seeking help. Apparently Emma had given birth 2-3 weeks prior, her puppies were taken by someone, and she was dumped in the area. People in the neighborhood stepped up to make sure Emma was taken off the street and her story touched many people who donated to her cause. 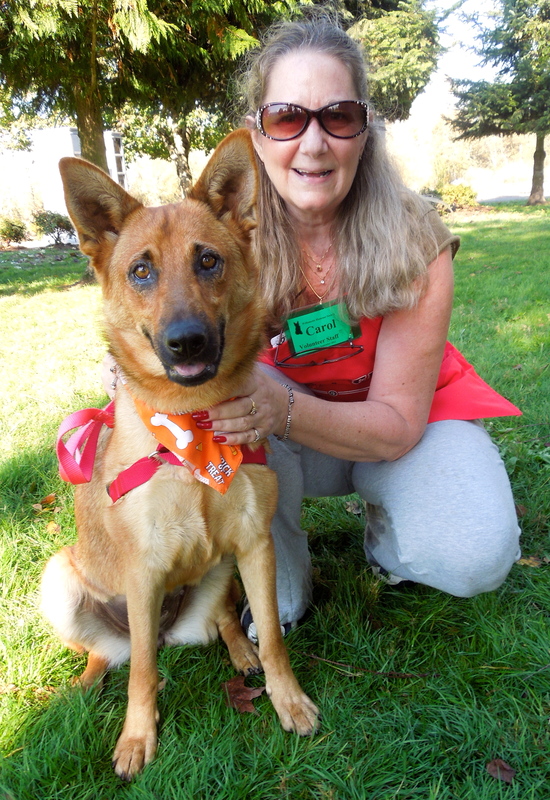 After being in a California shelter for four months, she was accepted by the S.T.A.R.T. team to be transported to WHS to start a new life. 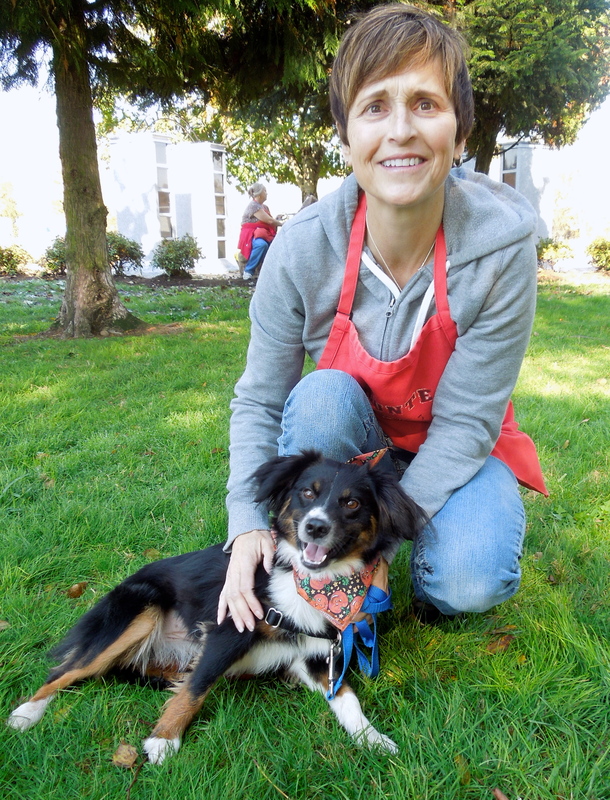 Emma has become a favorite of staff and volunteers who see her as a good-natured, affectionate dog who is hoping for a forever home in Oregon. She is a smart and sensitive soul who would be a wonderful companion for jogging, walking, or just to sit beside you at home. She will be a loyal friend. The woman who opened her car door and her heart to Emma in California checks in with me frequently to ask about Emma. She and we are hoping for a wonderful home for sweet Emma. 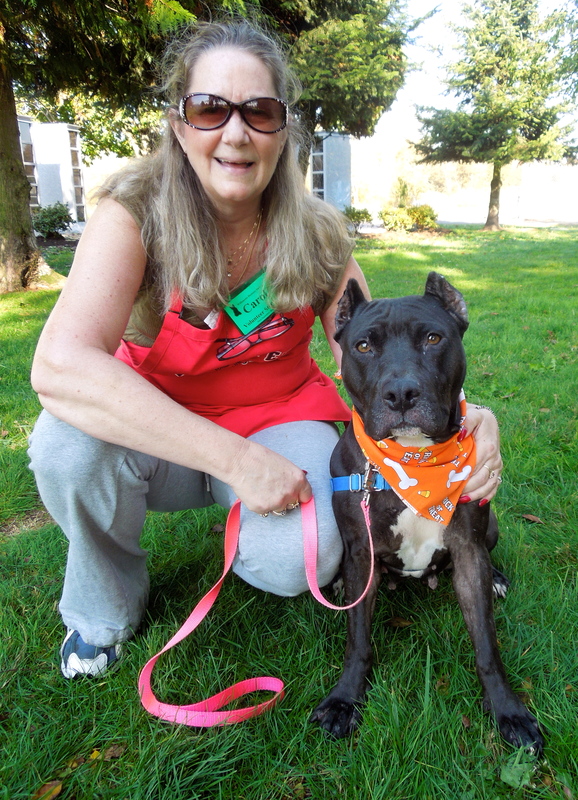 Volunteer Carol became another Emma fan today! Gilbert has been waiting for his forever home since his arrival last December. He has been in a foster home for the last several months. He continues to hope that soon he will be adopted by his perfect fit of a family. Here is his latest report. 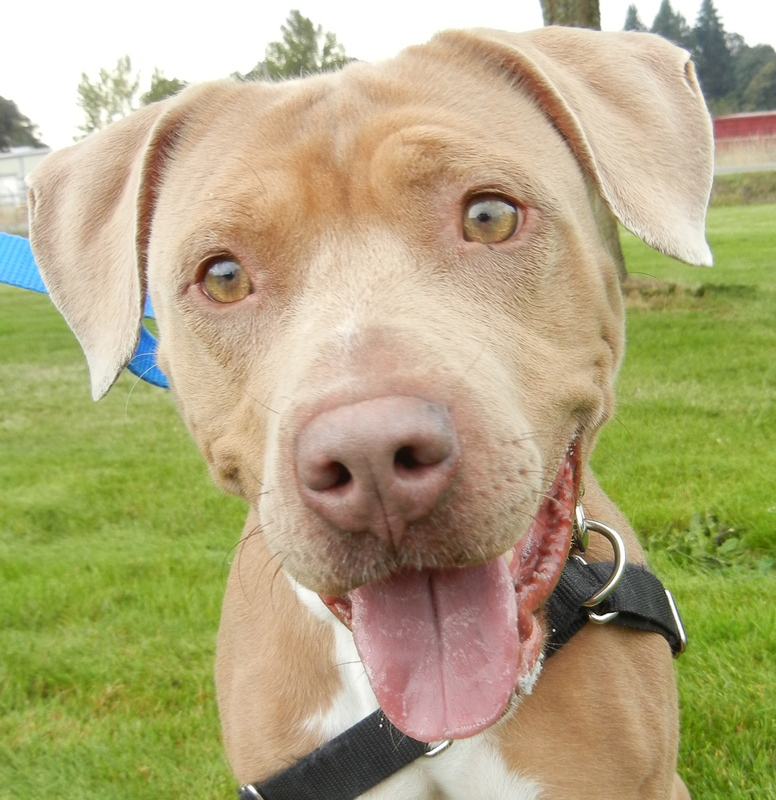 Faye is a two-year-old Pit Bull Terrier mix who has been at the shelter since August. She loves people and play group. Her kennel presentation isn’t always the best, but she has a good heart and will be a loyal friend. Her adoption comes with a WHS training class. She enjoyed spending time with Joan today, but I couldn’t get her to smile. I cannot understand why Jersey has not been adopted. 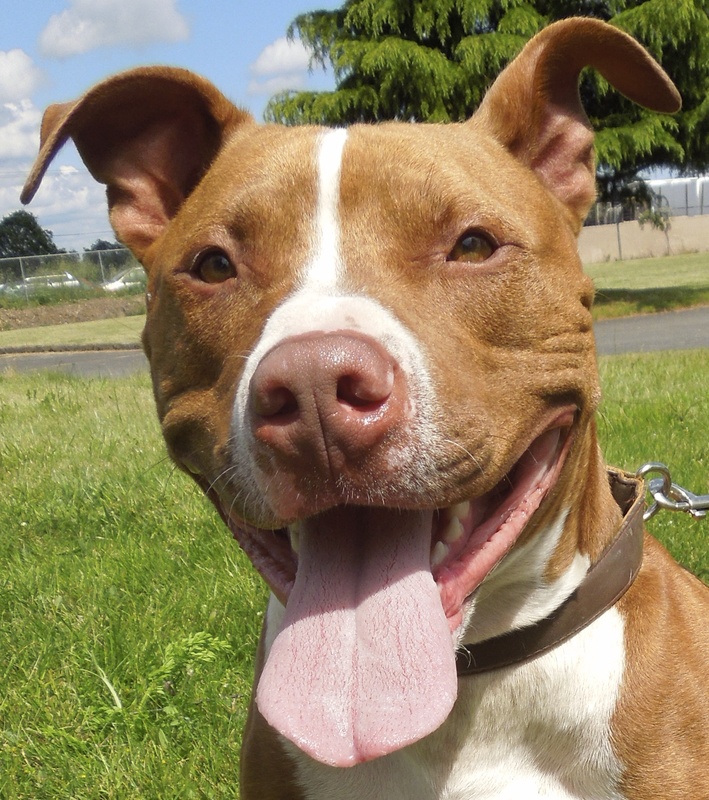 She is a three-year-old Bull Terrier mix who has been waiting for a home since July. She loves people and has good manners. She might do best as an only dog in the family. I’m hoping that the perfect family for this good girl will come soon! Joan enjoyed playing with her this afternoon. 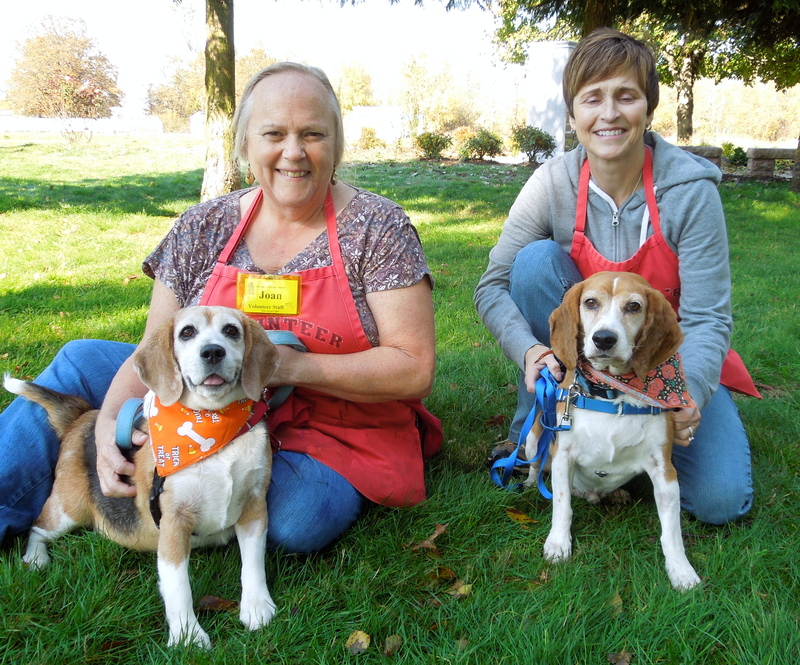 Tara and Hunter are a bonded Beagle pair who need to find a home together. Tara is nine and Hunter is eight. They have lived together their entire lives. They have been at WHS since September. 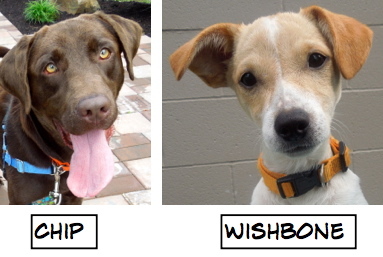 I’m hoping that a “Beagle person” will discover these two fun characters and take them home! Today they spent some quality time with Joan and Angie. 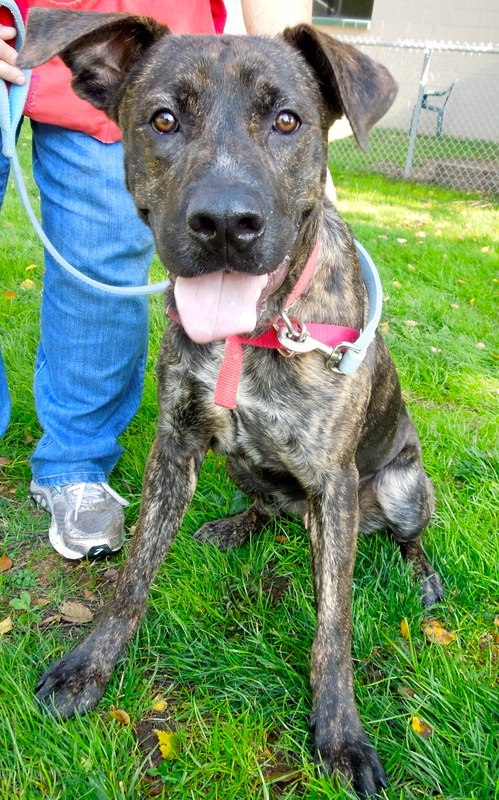 Bo arrived at WHS on August 11. He was shy and his coat was patchy. It was decided his medical issues needed to be addressed before he could be put up for adoption. 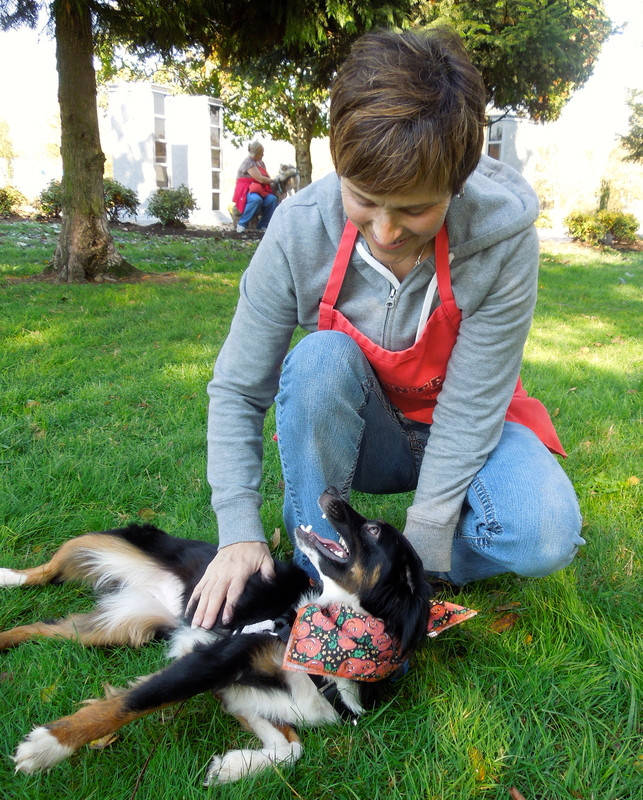 For several weeks Bo’s gentle personality won him many staff and volunteer fans, including me. One staff member especially fell in love with Bo. Here is her story. I also received this wonderful update for a dog I met only briefly before he was scooped up by a loving couple. Here was Cinco when I met him. For my long-time blog readers, you’ll remember Simba. She was one of my favorites from the moment I met her in October 2011. 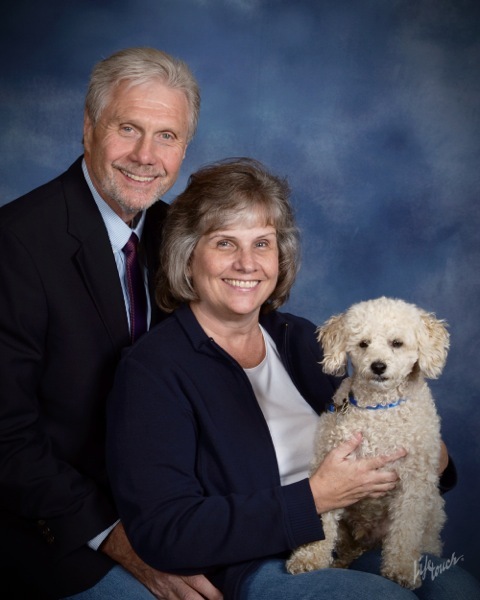 She won the jackpot with a terrific home with a family who rescues dogs. I received an update on her a few months ago. Last week I asked for and received a new one. This was Simba when I met her. “Zuna is our angel. We couldn’t ask for a better dog. She had her issues at first. But this is what happens in new families. We got to know each other and she learned our expectations quickly. Now she’s in a pack of 4, her BFF is a 3.5 pound Chihuahua. They are the princesses of the castle and the best behaved! They spend their days curled in a ball snuggled on my bed. She is a bike riding machine and goes for a run every day, then back to bed! You’d never know she was a running dog by the way she is in the house, as mellow as they come. She has taken to bringing the best out of any dog with previous dog issues. She used to panic and screech around new dogs, scaring the owners and everyone else! But she now can be in a pack of dogs without breaking her focus on us, eye contact is always there. 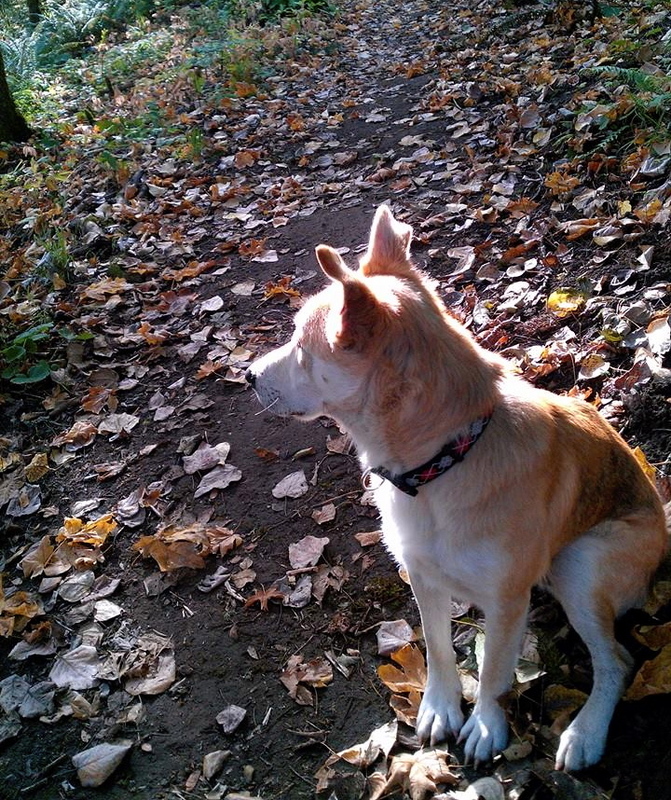 She could easily be off leash (but never is) on her walks and outings. She is in the heal position at all times. She isn’t just smart, she’s a true Pitty…all about pleasing her people. She trusts us entirely and wants to please. She knows she’s safe with us and that we wont lead her in the wrong direction. She enjoys being a step-mama! 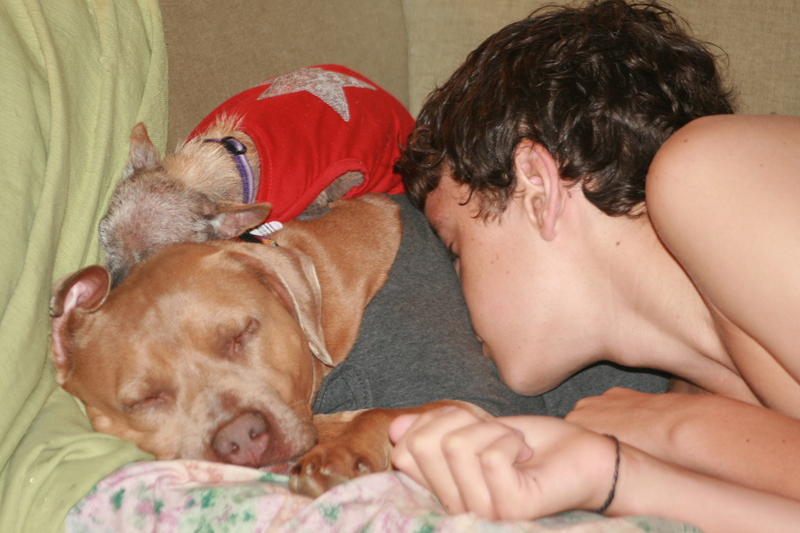 All the scared dogs flock to her for comfort and she pulls them gently out of their shell. Puppies love her, she’s a great pitty advocate, meeting all our children, parents, and friends with her gentle presence and sitting nicely for a belly scratch. 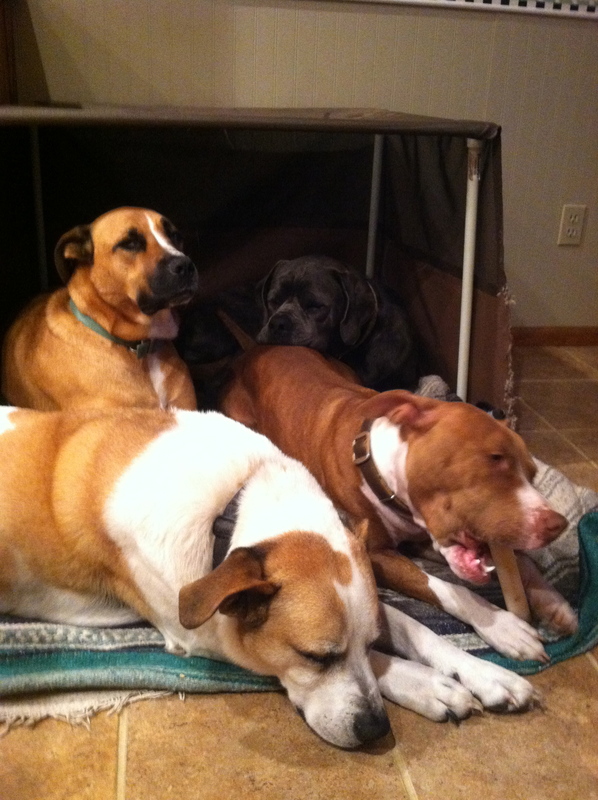 As rescuers, we spend a lot if time rehabilitating dogs. Zuna is such a great example. 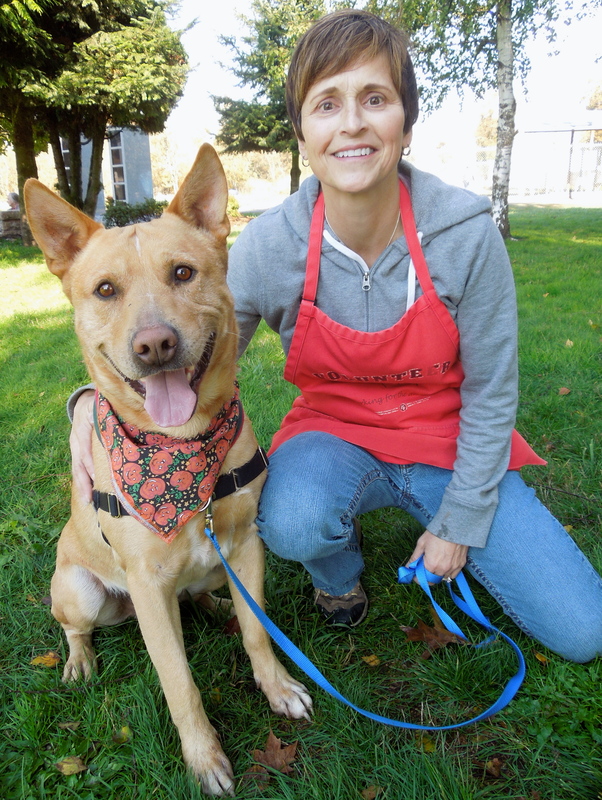 She plays a key role in a dog’s progress from shy shelter dog, to outgoing family dog. That’s it for this week! This Saturday evening is the annual Bowser’s Boo Bash. I’ll be taking pictures and will tell you all about it next week! Hope to see many local animal lovers there! I love all your pictures martha. I cannot say enough about Reno. 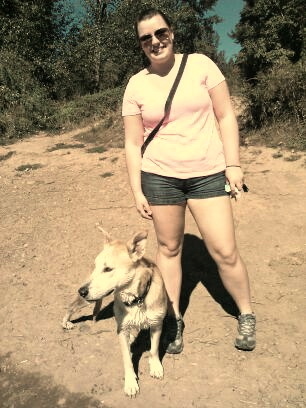 he is wonderful, gentle, walks so well on the leash. Loves tennis balls Spent extra time with him this morning. 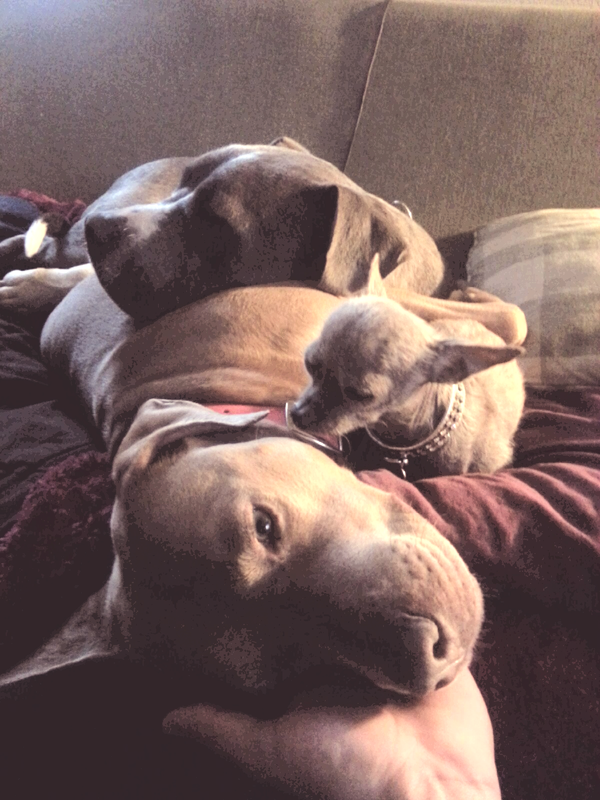 Wish my hubby would let me have another dog right now. Emma is also wonderful girl!